Metropolitan Police Commissioner Sir Ian Blair did not overlook black and Asian officers to promote white candidates, a tribunal has ruled. Last week, a panel dismissed Commander Shabir Hussain's racial discrimination claim against the force and the Metropolitan Police Authority. The officer claimed he was overlooked for promotion four times. But the employment tribunal said this was because others had more experience or performed better at interview. The panel, making its judgment public on Tuesday, dismissed Mr Hussain's claims that the Met's top ranks were restricted to a chosen "golden circle" of a few white officers. They noted: "On the evidence provided to us we are not satisfied, and do not find, that there was such a golden circle." 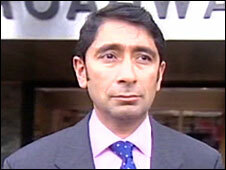 If in fact there were such a circle, Mr Hussain was "as much a part of it as some of his rivals", the tribunal suggested. The ruling comes after another high-ranking Asian police officer accused the Met of racial discrimination. Assistant Commissioner Tarique Ghaffur's claims that he was "sidelined" by Sir Ian Blair are expected to be heard at a tribunal next year. However, the Met's director of human resources, Martin Tiplady, was criticised in the judgment. The panel said his evidence was "unsatisfactory" and noted he had been "unhelpful" towards Mr Hussain on various occasions. Mr Hussain's claim accused Sir Ian, the Metropolitan Police Authority and its chairman Len Duvall of racial discrimination. "My face did not fit and did not fit because I am not white," he told a hearing in Stratford, east London, in June. Sir Ian was forced to defend his record on diversity, telling the tribunal that claims he blocked the promotion of an ethnic minority officer were "inconceivable". Mr Hussain, who remains a serving Met officer, said he was "disappointed" by the judgment but believed the tribunal hearing had exposed the "shortcomings" of the Met's promotion process. A Metropolitan Police spokesman said: "The Metropolitan Police Service (MPS) is pleased to be vindicated of racially discriminating against Commander Hussain and we are disappointed that he felt it was necessary to bring this case." He added: "Commander Hussain remains a valued senior member of the MPS, performing an important role for the people of London."